Imagine if you never brushed your teeth for 10 years! Unfortunately, for too long this has been a reality for too many of our pets. Dental health is just as important for our four-legged friends as it is for our kids and ourselves. 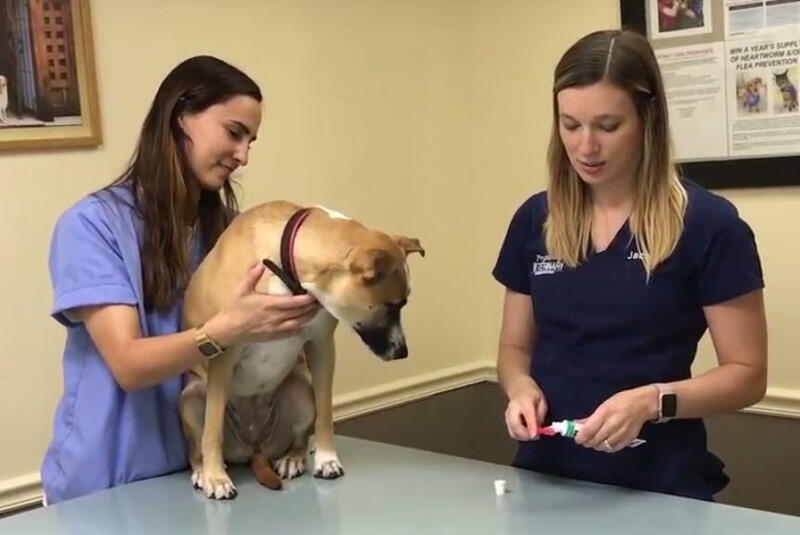 Bacteria that builds up on our pets’ teeth over the course of years contributes not just to tooth decay, bad breath, and gum disease, but is also a long-term contributor to diseases including heart disease as well as kidney and liver failure. Every time that your pet swallows, he or she is flushing bacteria from the mouth down through the entirety of his or her body. When we clean our pets’ teeth, we are removing much of this harmful bacteria and greatly decreasing their chances of certain serious health problems later on in their life. The most effective way to clean our pets’ teeth is by a full dental deep cleaning performed by your veterinarian and dental technician -this is an expensive full-anesthetic procedure. In many cases the frequency of professional dental cleaning can be minimized by at home dental care. The most effective way to keep your pet’s teeth healthy is by brushing their teeth. When possible, try to get your pet used to having his or her teeth brushed from a young age. If you start the process when they are still puppies or kittens, they will be more likely to tolerate it as adults. As you can see from our video, Jaclyn started out brushing Luna’s teeth as a puppy and now she is very well behaved for it! If your pet is already fully grown, don’t despair! You can teach an old dog (or kitty) new tricks! Make sure that you use a pet toothpaste and not human toothpaste as the fluoride in human toothpaste is hazadarous. Start out by placing a little bit of toothpaste on your finger and begin just by rubbing your finger gently over their teeth to get them used to the motion and taste. Sometimes, it might be best to do this for a few days before even introducing them to the toothbrush itself. Then, put the toothpaste on the brush, and very gently begin the process of brushing their teeth and gums. Do not do this too vigorously. Remember, the goal is to make the process as stress free as possible for them. Over time, using this method will allow you to make more and more progress in being able to fully brush their teeth. Ultimately, you should try and do this process once every day, but remember: any tooth brushing is better than none, so just do the best you can! In addition to brushing your furry friend’s teeth, there are other methods of tartar control that we recommend. There are specialty treats that help clean your pet’s teeth just from their chewing on them. We recommend Butler Schein™ Enzy-Chews™ or Virbac™ C.E.T. ® VeggieDent® chews. We also highly recommend Hill’s™ brand T/D™ diet, which can be given as a treat daily. It is a specially designed chewy kibble that helps to pull the tartar off the teeth. None of these treats are to take the place of brushing, but they are wonderful supplements to help keep those teeth shiny and clean. Click here to view our YouTube video!